French President Jacques Chirac has warned he will not accept any UN resolution allowing the United States and Britain to administer post-war Iraq. Speaking at the end of a European Union summit in Brussels, Mr Chirac said France would reject any moves that "would legitimise the military intervention and would give the belligerents the powers to administer Iraq". "That would justify the war after the event," he said, describing the US-led invasion of Iraq as a tragic moment that would be likely to have unforeseen consequences. President Chirac was speaking after the British Prime Minister, Tony Blair, urged the EU to support a new UN resolution setting up a post-Saddam Hussein "civil authority in Iraq". The BBC's Patrick Bartlett in Brussels says the French leader - who had earlier said he would veto any UN resolution authorising the use of force in Iraq - has made clear the battles in the UN over Iraq are far from over. 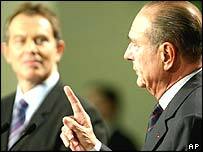 Jacques Chirac and Tony Blair held talks just before the end of the summit in an effort to clear the air after a week of bitter diplomatic exchanges over Iraq. Mr Blair's official spokesman described the atmosphere as "good" and said the two leaders had agreed they needed to work together to overcome their differences. But at a news conference after Mr Blair had left, the French president said the US and Britain had placed themselves outside international legality over Iraq. President Chirac rejected outright the "post-Saddam" proposal by the British leader. Our correspondent says that Mr Chirac was also decidedly cool on Mr Blair's assertion that Europe should play an important role in reconstruction after the Iraqi conflict was over. President Chirac said the cost of rebuilding Iraq was not an issue that could be discussed now as the destruction was still going on. Mr Blair and President Chirac had earlier spent an hour, with the 13 other EU leaders, wrangling over the wording of a joint declaration on Iraq. At the summit, France, Germany and Belgium criticised the US-led war, but Britain and five other nations - Spain, Italy, Portugal, Denmark and the Netherlands - supported it. The UK agreed a French move to drop a paragraph from the new EU declaration expressing regret that Iraq had not used UN resolution 1441's opportunity to disarm, "and that a peaceful resolution of the Iraqi crisis was not achieved". But Mr Blair refused when Mr Chirac tried to remove a paragraph reaffirming that the EU's objective remained Iraq's "full and effective" disarmament. Backed by Spain and Austria, Mr Blair insisted the words stay in - although they were moved further down the text. It called on the EU "to explore means by which the EU might help the Iraqi people to achieve the objectives of living in freedom, dignity and prosperity under a representative government".